We left Toas, New Mexico very early to try to beat the heat. We knew we had some serious climbing ahead of us, plus we were ready to see come mountains! We had to be quiet leaving the park as it was only 6:30 in the morning. Starting our loud diesel engine while someone nearby is sleeping is a bit rude. After taking Alpha to use the facilities (i.e., the dump station) we were on our way. We planned to avoid Highway 64 through the San Juan Mountains because it looked like a steeper climb. Instead we followed Highway 68 back to Espanola and followed Highway 84 north to Pagosa Springs, Colorado, just across the border. 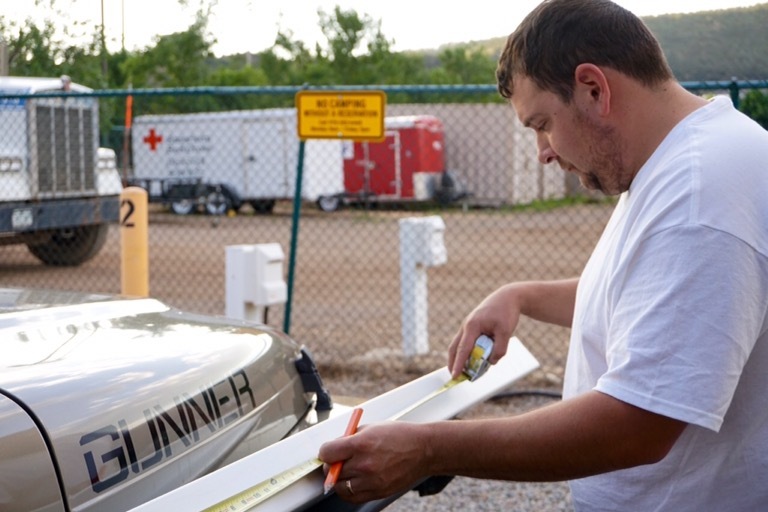 Where Highway 96 intersects with 84 we noticed a sign with a vehicle restriction: vehicles weighing less than 10,000 lbs and under 30 feet in length only. We don’t qualify as either. However, there wasn’t anywhere to turn around so we continued down 84 despite the warning. Our other option would have us driving through another desert. Our plan was to drive a bit farther, look for a spot to turn around, and evaluate the road. The restriction might have been referencing Highway 96 and not 84. The placement of the sign wasn’t exactly clear. We hadn’t driven very far when we started seeing big rig truckers and full-size motorhomes towing cars coming from the other direction. If these guys could make it so could we. But if we came across a sketchy bridge that might not hold our weight, we would still turn around. The first half of the drive was lined with enormous red sandstone cliffs. The scenery suddenly becomes lush and green when you enter Colorado on the other side of the cliffs. The entire drive is gorgeous and we have no idea why there would be a vehicle restriction on this road. Although there are some steep climbs and some narrow curves, we were one of many large vehicles easily navigating the road. Our spot in Durango is one of my more creative campground finds. 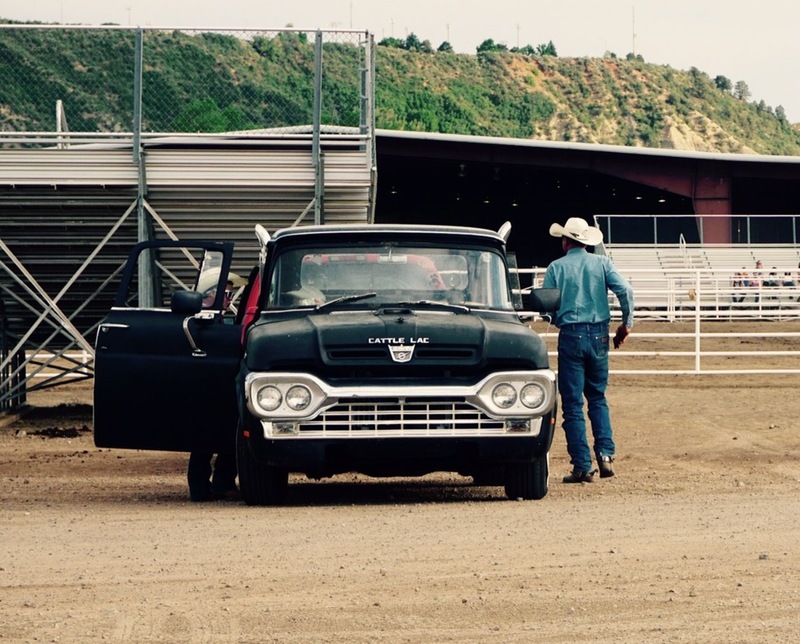 We would be staying at the La Plata County Fairground in Downtown Durango. 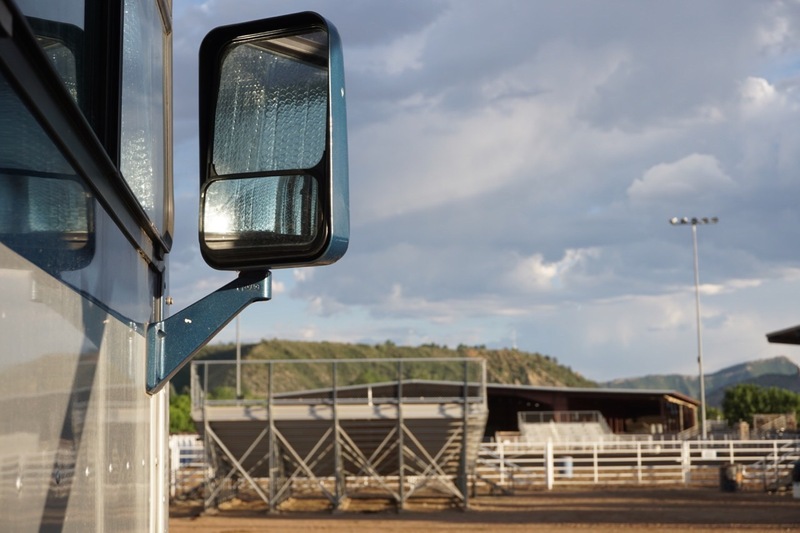 The fairground has six RV spots set up in the livestock trailer parking area. All have water and electric but only spots 1 and 2 have 50 amp service. We were in spot 3 but were able to use the 50 amp service at spot 2 by using a longer extension cord. We would have to move back to our own electrical post if someone showed up to stay in spot 2 but no one ever did. This campground really is an underutilized gem in Durango. 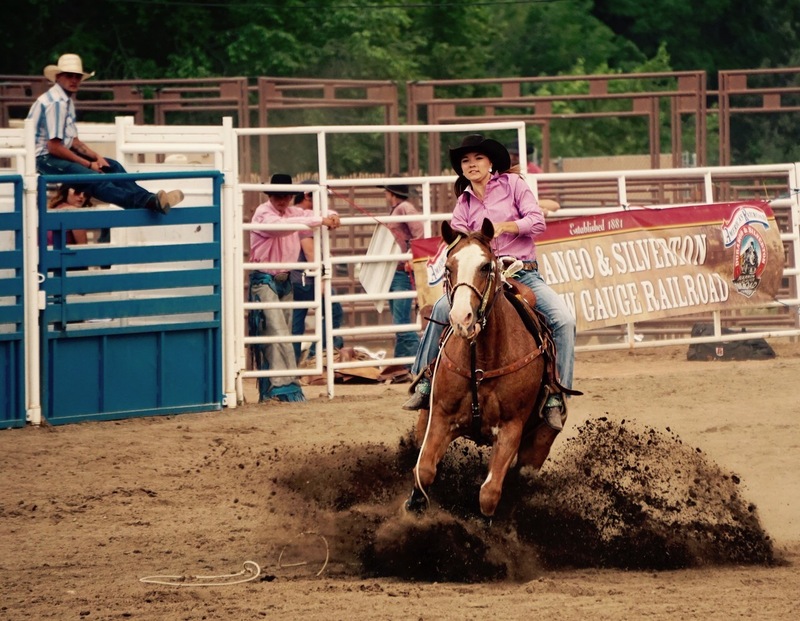 All of the spots are covered in gravel, fairly level, and the nightly rodeos are free! At only $16.50 it’s a steal for a campground right in the heart of town. We could take the downtown trolley to Main Street (it stops at the fairground regularly) or drive a very short distance and park. You could also walk or ride your bike down the path along the river. 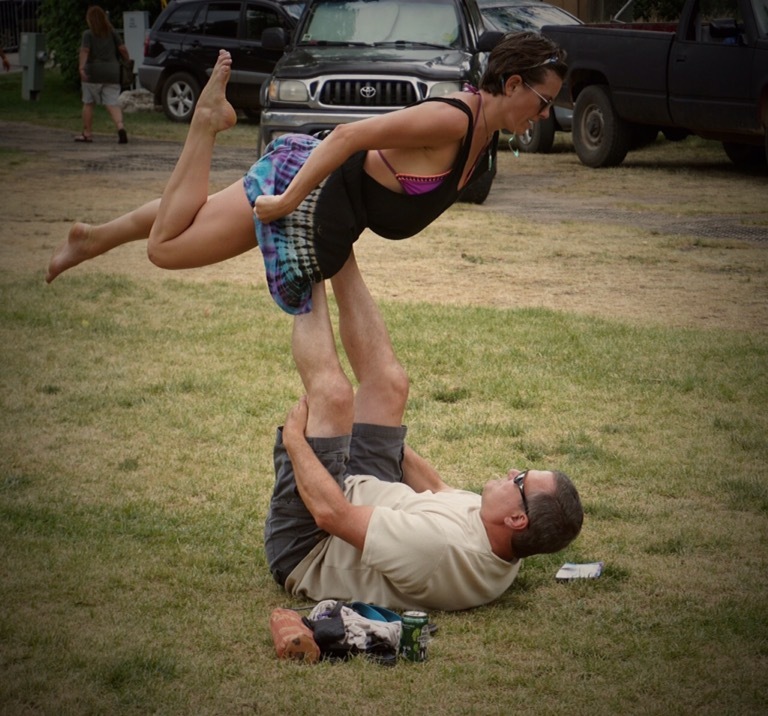 The downsides are the complete lack of shade (this is still a dirt parking lot), the industrial area right behind the campsites (point your lawn chair the other way and you’ll never notice it), and if you’re looking for some peace and quite, the nightly rodeos might be a problem. 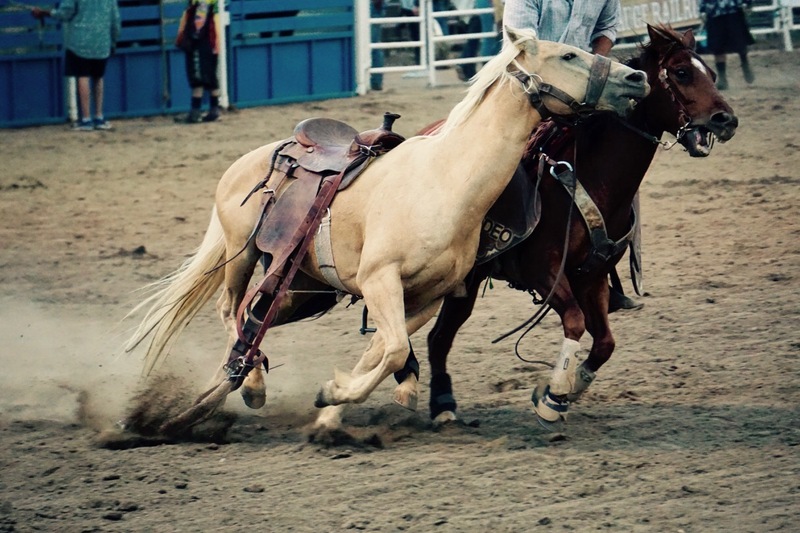 Technically, the rodeos were not nightly, but there was at least some activity at the arena every night. Around 6pm the trucks with trailers full of horses would start to arrive. Most nights it was just locals practicing or small clubs gathering to ride. 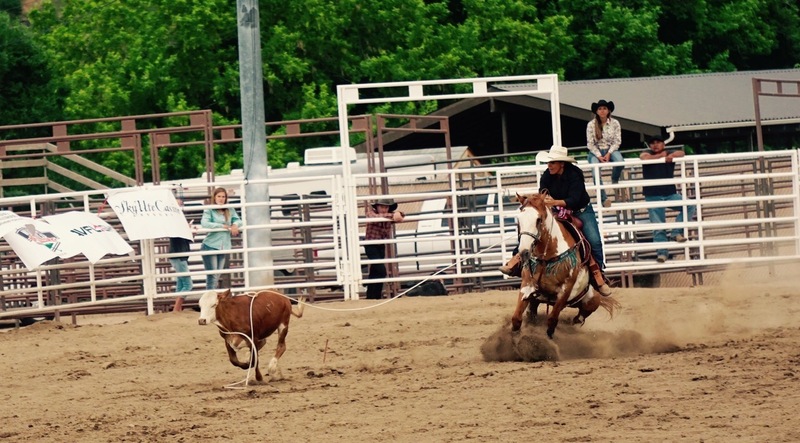 But our very first night there was a full-fledged rodeo. 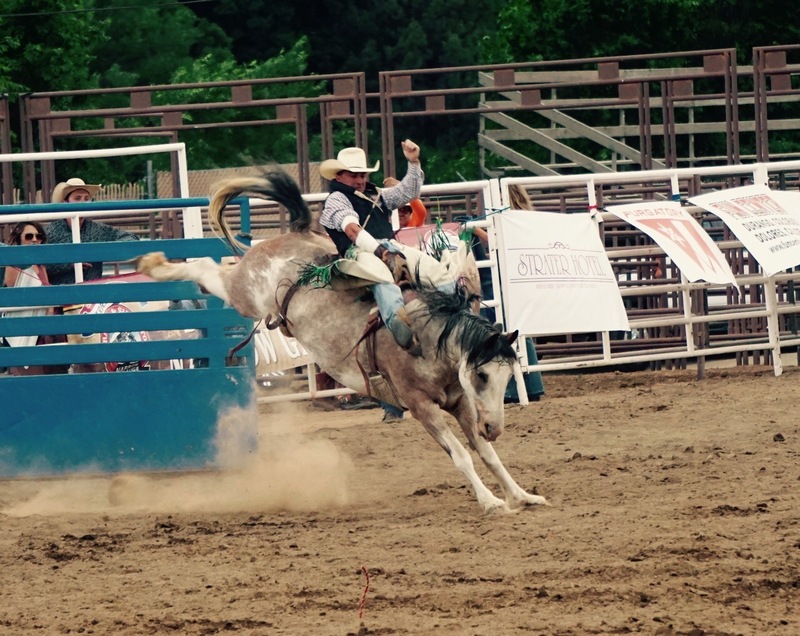 Rodeo clowns, bull ridin’, mutton bustin’, and cold coors light. 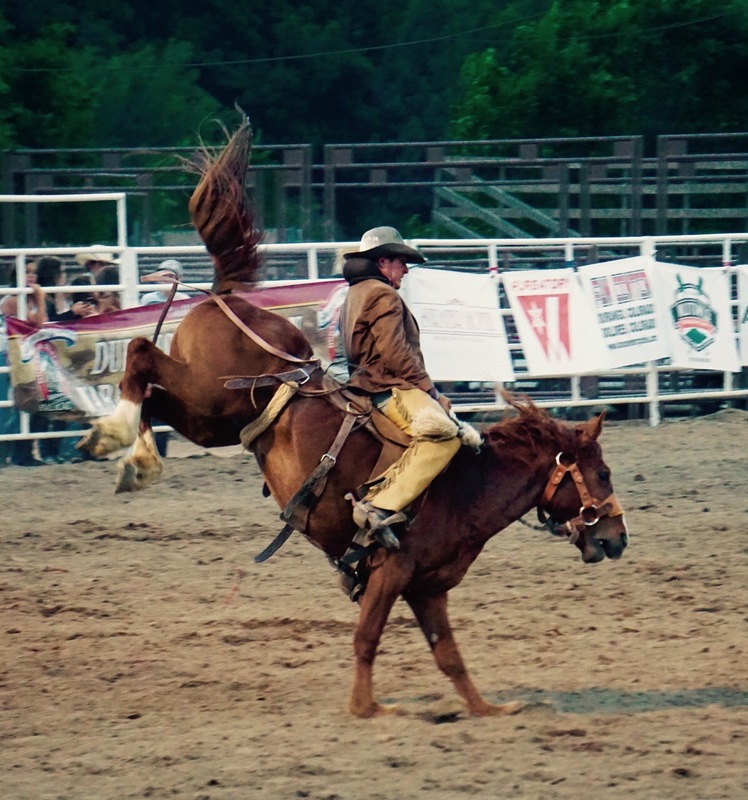 It was a local rodeo and most of the participants were highschool and college-age kids from nearby areas, but we had a blast and the locals were very welcoming. They told us we could come sit in the stands, no charge. We were only about 70 feet from the arena but there was much more action visible up in the stands. Many of the riders were pretty good (or at least I thought they were) but the announcer was god awful. His stack of notes was carried out the window by a gust of wind and scattered under the stands. 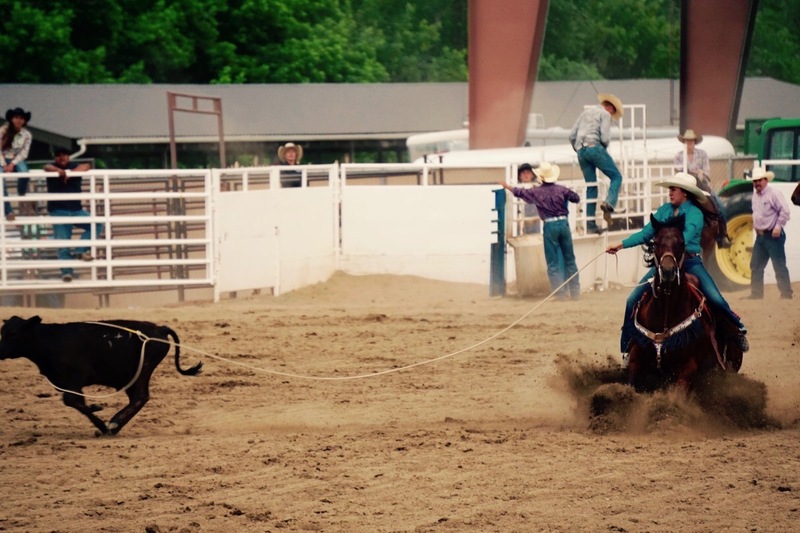 He spent the next few hours making little kids feel bad (“He really blew that one!” – referring to mutton busting, which is a contest for kids under 10 where they try to ride a sheep. It’s hysterical but not really about winning.) and telling lots of jokes about his ex-wife. No one was safe. But who knows, we’re from out-of-town, maybe he was hysterical to the locals. We didn’t sit in the stands on the nights when riders were just practicing but having so much activity right outside our front door every evening was pretty fun. It was always over between 9 and 10pm so it didn’t bother us at night. The next morning we were really in need of what long-distance hikers call a “zero day.” On a zero day hikers don’t put down any miles. Instead, they head to town to take a real shower, eat a hot meal, pick up their resupply box at the post office, and rest their bodies as much as they can. In our case, a zero day means not making any big plans, staying close to home, and taking care of some of the life stuff that always piles up on our to do list. I filled out and mailed my passport name change application, mailed the post cards and boxes of gifts we had been gathering, and most importantly, worked on the blog and editing our recent photos. After stopping by the post office to mail all of our goodies, Brandon took me to lunch at the Chimayo Wood Fired Kitchen on Main Street. The restaurant was large and full of modern industrial decor but was mostly empty of customers when we went around 3m. They were serving their between lunch and dinner happy hour menu, which worked great for us. We each had a fancy cocktail at half-off and a personal pizza. I had the mushroom pizza with carmalized onions (so rich and savory!) while Brandon had the southwest steak pizza (spicy, delicious, and very inventive). Both were fantastic and, at least at happy hour, reasonably portioned for one person. 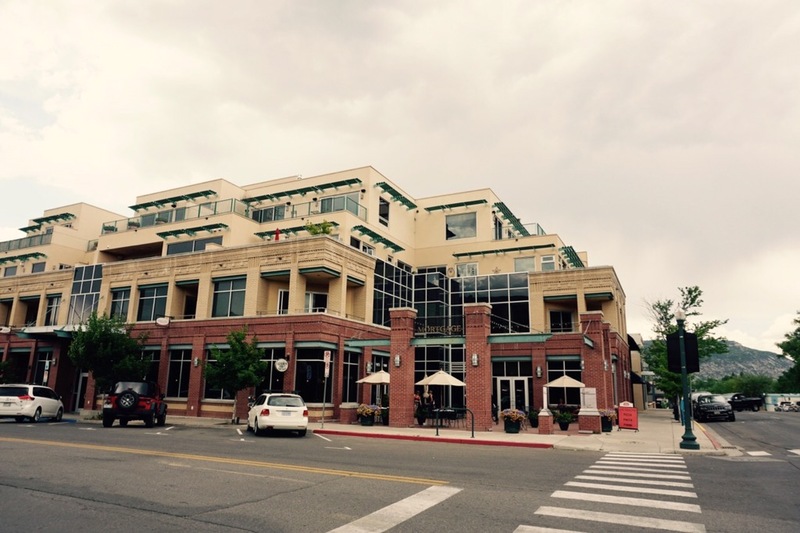 We were actually really impressed with all of the restaurants we ate at in Durango. We enjoyed an excellent Italian lunch at Guido’s Favorite Foods, a restaurant and Italian market that serves homemade pasta and other Italian delights. I had the linguine with clams, mussels, and a white wine caper sauce, while Brandon had Guido’s Favorite Panini. Also good was the Old Tymer Cafe. They specialize in burgers but I highly recommend the BLT. A simple sandwich, but so good when all the ingredients work together. The one at Old Tymer is a double stacked BLT but if you’re really hungry it’s perfect. Guido’s Favorite Foods is on the corner, street level. On our way back from lunch we stopped at the most adorable bookstore, Maria’s Books on Main Street. I love bookstores and libraries and finding a good local bookstore thriving despite the move towards e-books makes me very happy. Maria’s was not a huge store. It was one story with a tall ceiling. Shelves were stacked clear up to the ceiling and old-fashioned rolling ladders were installed to reach the higher shelves. The selection was quite good too. There was a curated selection of new books loved by the employees, an inspiring travel memoir section, excellent stationary, as well as all of the other sections that you would expect at a decent bookstore. The inventory was not vast, but appeared carefully selected. Amazingly, I refrained from buying anything. I already own so many books I have yet to read and my shelf space is limited. We did, however, find a great book that outlines the local Jeep trails and includes maps and turn-by-turn directions. This should come in handy when we make it to Ouray, Colorado, just a few hours north. The town touts itself as the Jeep Capital of the World. 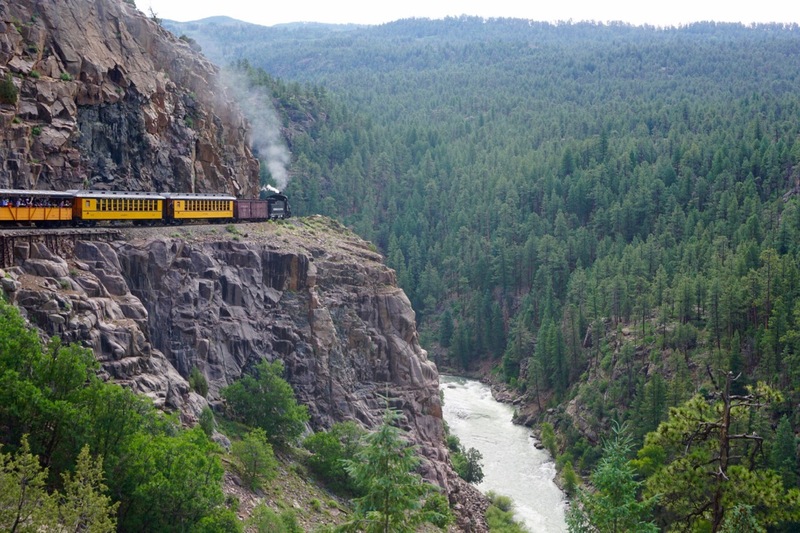 The next morning was the main reason we came to Durango, riding the famous Durango-Silverton Narrow Gauge Railroad! I rode this train once before, when I was 11, and remember it being a ton of fun! When I was a kid we went on a lot of road trips. It was usually me, my brother, my mom and her best friend Lyse, all stuffed very comfortably into my mom’s big Ford Econoline van. Some of these trips followed the path of trips my mom and Lyse had taken in their youth. See Lovey and The Cowgirl Go West. Now we were recreating some of those memories ourselves. We got up at 6:30 am to catch our train at 8:15 am. Riding the train is an all day event if you go round trip in one day. 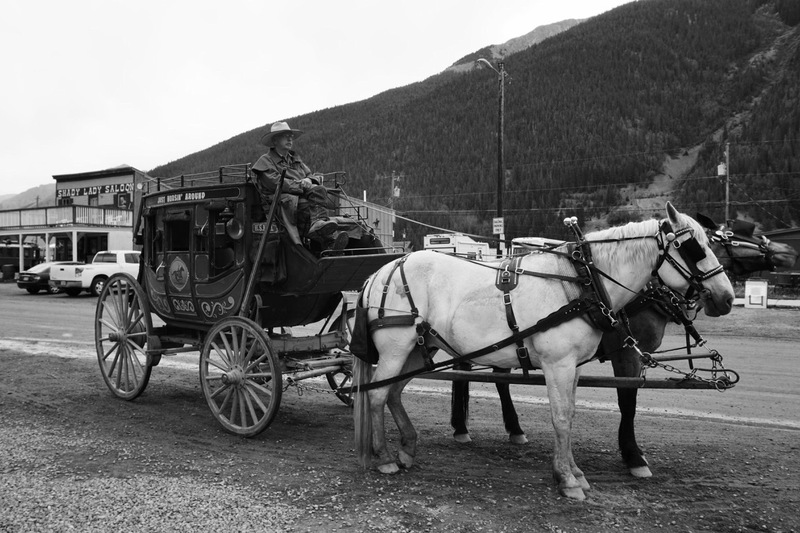 It is a 3 1/2 hour ride each way with a 2 1/2 hour stop to tour the mining town of Silverton. 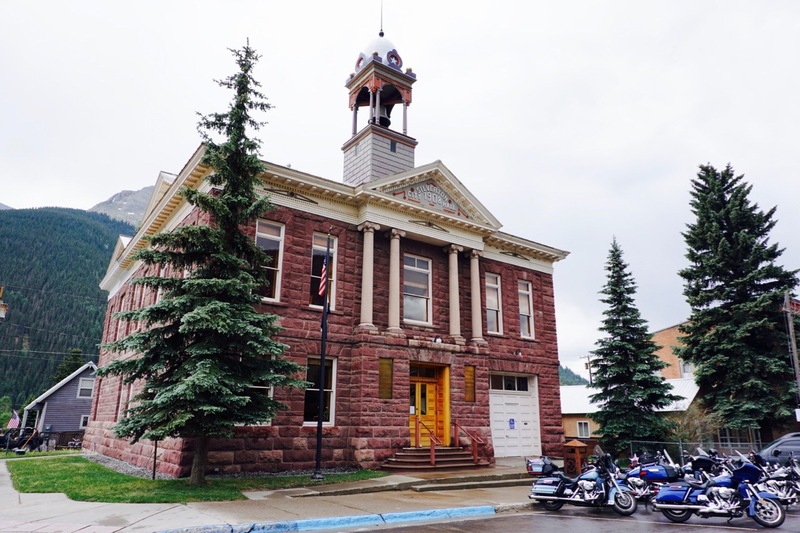 You can shorten the tour by riding the bus from Silverton back to Durango or extend the tour by staying overnight in Silverton and taking the train back the next day. We decided to take the train both ways, in one day. 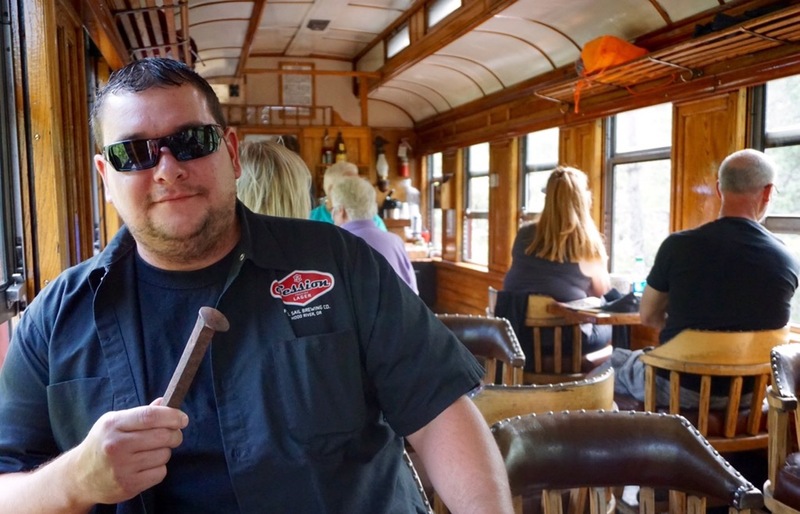 We splurged a bit and booked seats in the Alamosa parlor car, a 21 and up car at the tail end of the train. We had amazing views off the back platform as well as a bartender/tour guide specifically for our car. 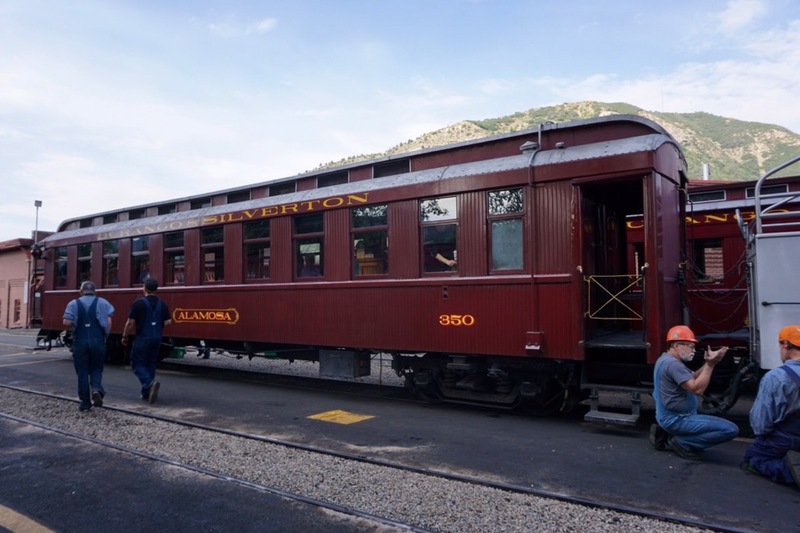 The Alamosa is also one of the vintage cars, built in the 1880s and refurbished for use today. Note that while I highly recommend taking this tour, it is not cheap. The cheapest seats cost nearly $100 for adults (kids tickets are less). Also, if you chose to ride in one of the open air cars, which looked like a fun option, bring layers and rain gear. It seems to rain every afternoon in the mountains and the temperature drops quite a bit as the train climbs in elevation. 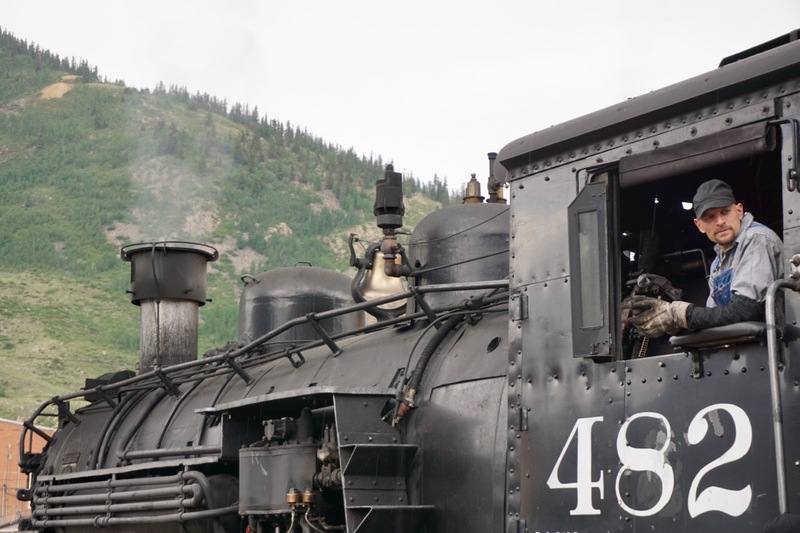 The train is a real steam train, powered by coal and water, and has been running the same route from Durango to Silverton since 1882. 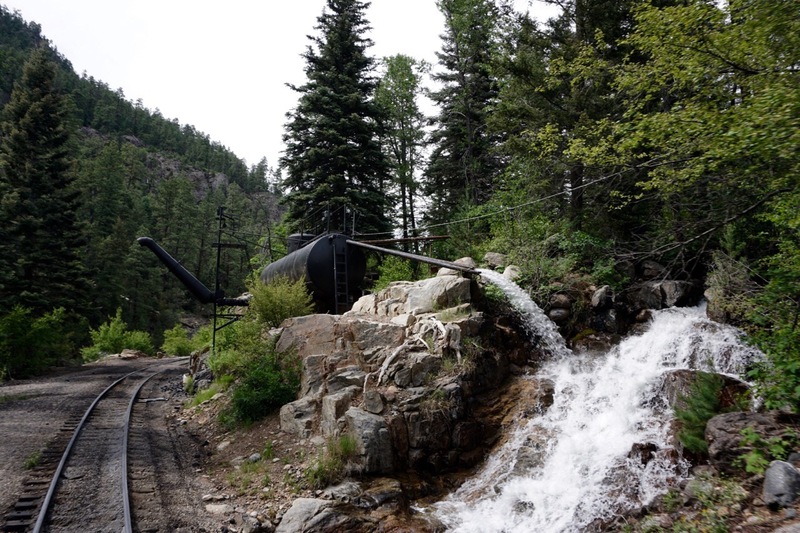 Because the train is powered by steam, we had to stop periodically to pick up more water. 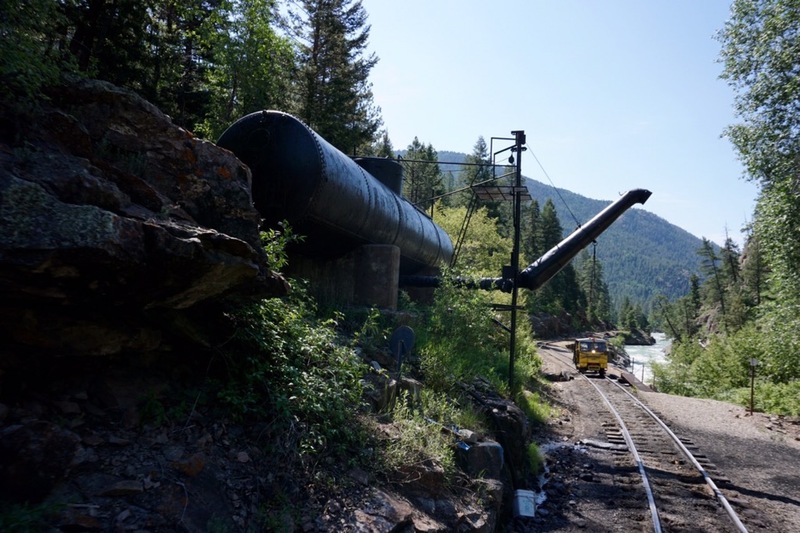 The water used to power the train is pumped from the Animas River, almost exactly as it was done over 100 years ago. Another interesting side note about old steam trains: they have a tendency to start fires. Small bits of burning coal can fly out of the engine room and set fire to grasses and trees on the side of the tracks. Our guide told us to keep an eye out for small fires we may have started but there was also a dedicated tail car that followed behind us looking for fires. The cars further up the line may not have even known about the tail car but we had a great view from our spot as the last car. 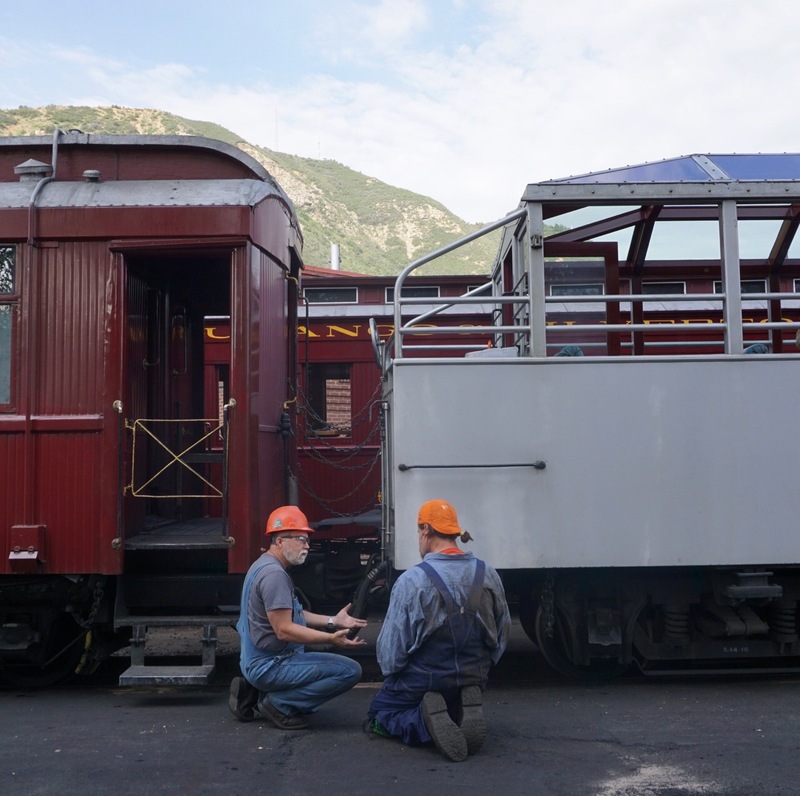 In the photo below you can see our conductor chatting with the tail car driver. In addition to looking for fires, the tail car also made sure that the different trains on the route were evenly spaced out. The railroad runs four different routes a day and it is very important that they don’t inadvertently run into one another. When we were stopped the tail car driver would set up a flare on the track and light it when we left. The flare was designed to burn for a set amount of time. If a train coming behind us saw a burning flare they could stop and wait until it burned out and know how far ahead we were on the tracks. Then they could be sure to stay an appropriate distance behind us. 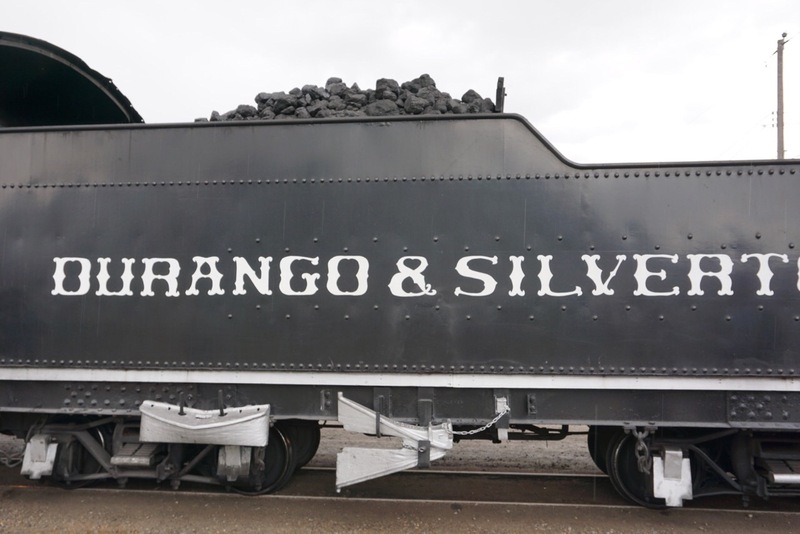 The railroad was originally built to connect the mining town of Silverton (and surrounding areas) with the bigger transportation hub in Durango. All of that gold found up in the mountains is only valuable if you can get it to someone willing to buy it. 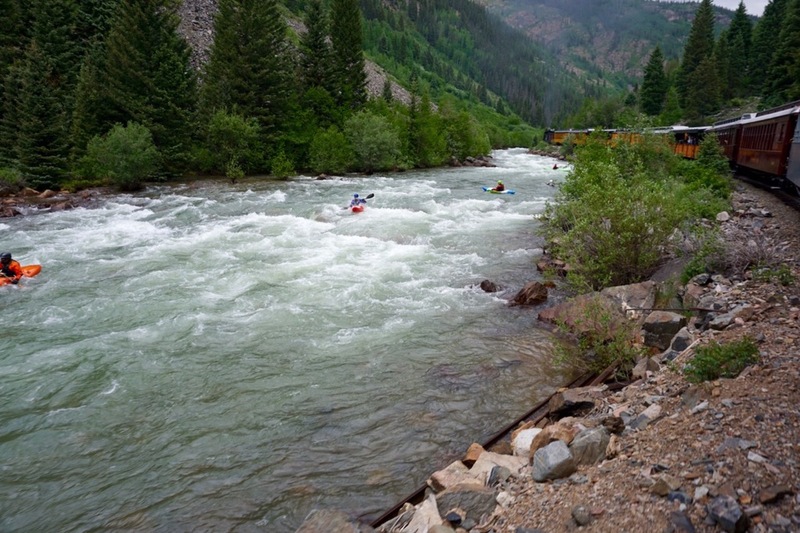 The route runs through the San Juan National Forest and is still the only transportation to certain areas of the forest. 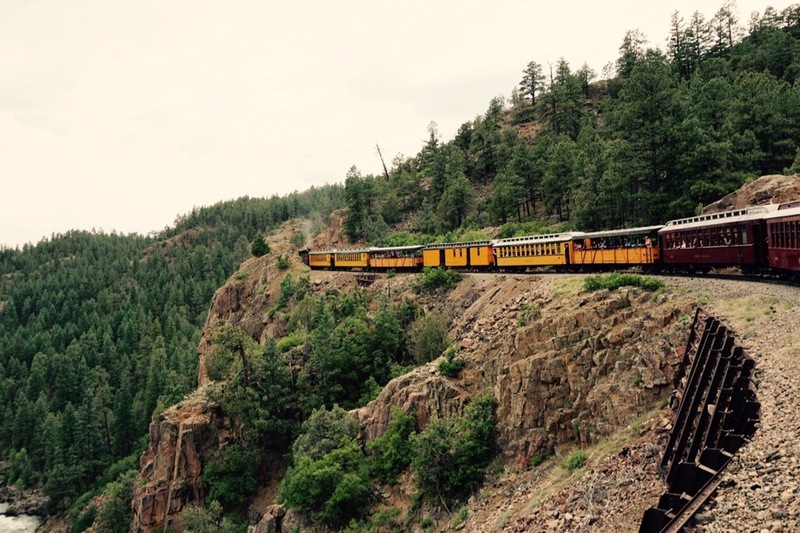 In addition to tourists, the train also transports hikers, fisherman, and kayakers. Because the train runs on a set schedule they can buy a round trip ticket, get dropped off where they want to in the forest and flag down the train however many days or weeks later when they are ready to head home. Another benefit to the private car was having a dedicated guide. Our guide/bartender was named Ellie and she was fabulous. You can see her behind me above, wearing the red vest. 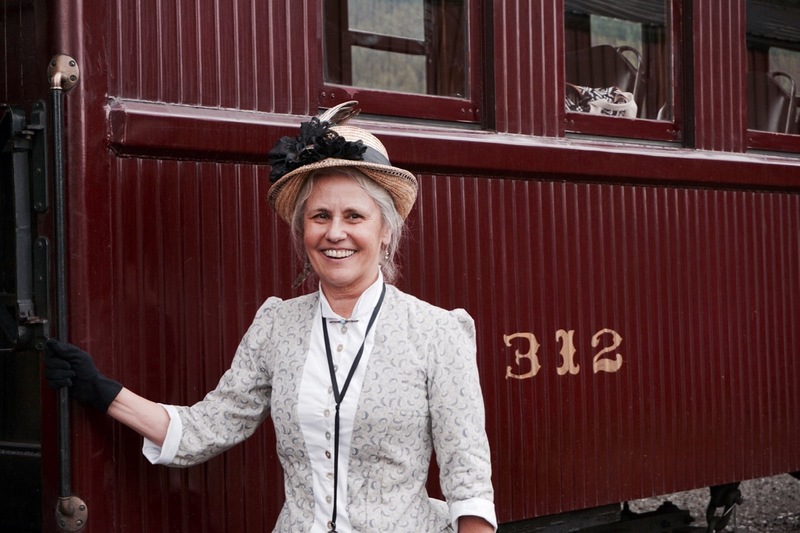 Ellie had spent 25 years working as a geologist in Alaska before moving to Durango and picking up a job working for the railroad. She has been doing this for 12 years now. 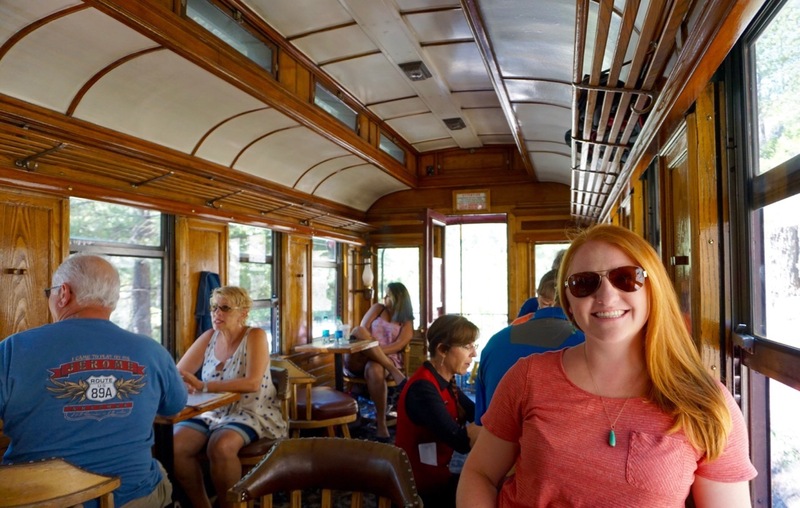 She says the railroad is a great employer and only requires her to work 4 days a week, so she always has a long weekend to explore the great outdoors. The job also gives her an opportunity to share her vast knowledge of the various rock formations and how this area was formed. We were a captive audience with nowhere to go so we were glad we got such an informative and entertaining tour guide. 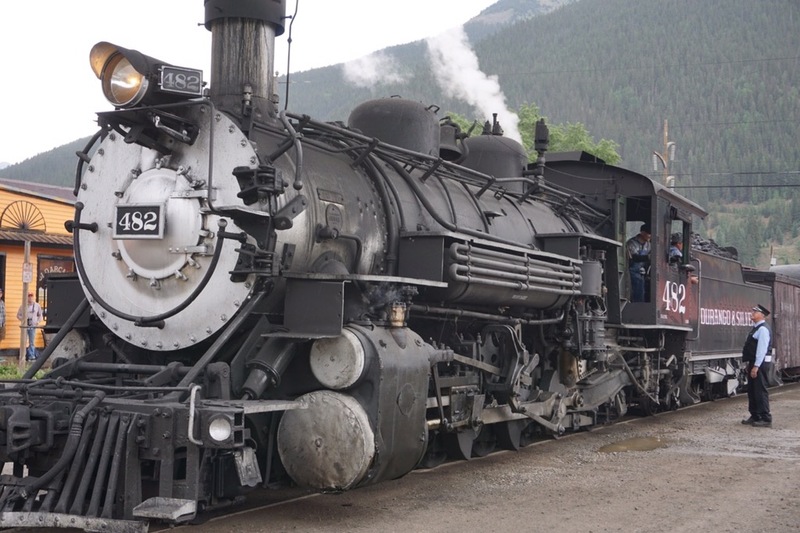 The 3 1/2 hour train ride winds through narrow canyons along the Animus River and through lush forests before finally arriving at the town of Silverton at an elevation of 9300 feet. 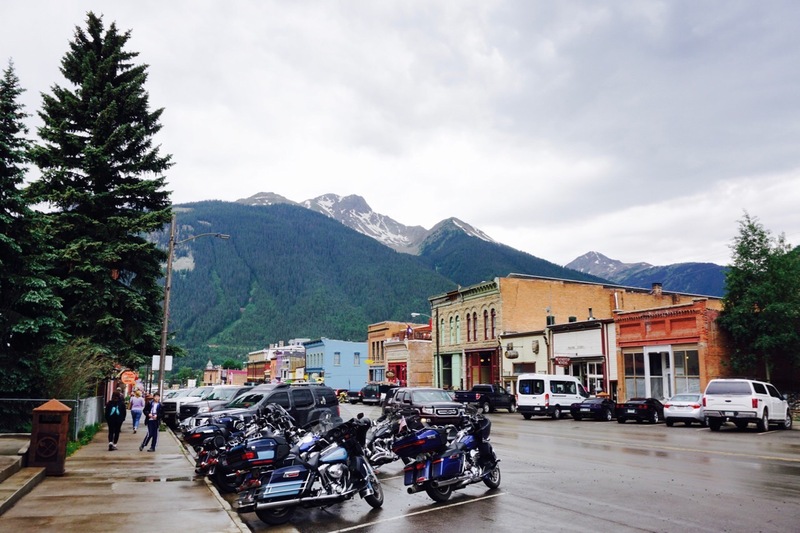 When we arrived in Silverton it was drizzly and overcast (a lot like Portland nine months out of the year!). With only 2 1/2 hours to disembark, tour town, get lunch, and reboard the train, you have to keep a pretty tight schedule. 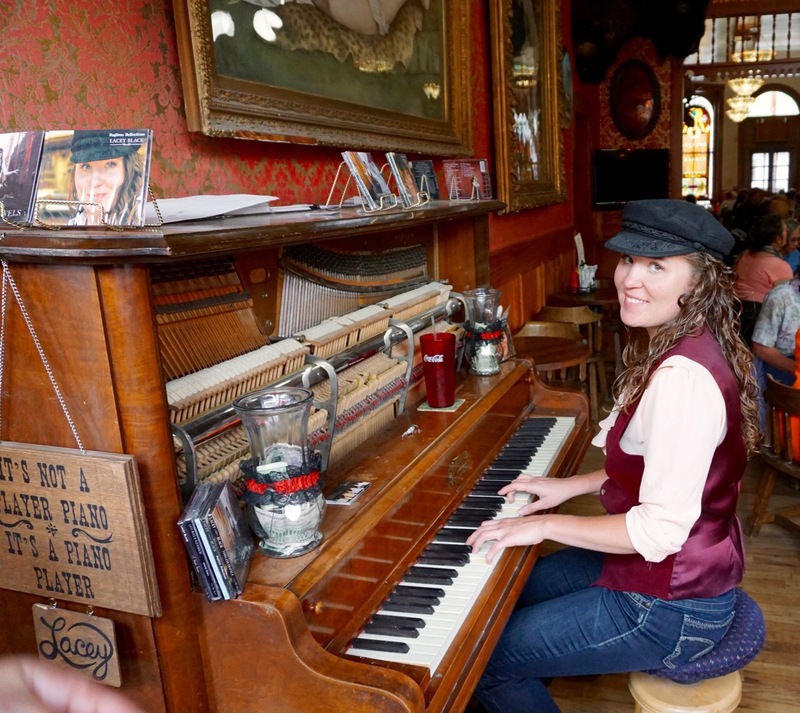 We decided to have lunch at one of the historic hotels because they had a ragtime piano player. The food was fast but very mediocre and we couldn’t hear the piano over the crowd. Brandon ordered a Mai Tai to drink and it looked the same color as anti-freeze but tasted okay (this is Colorado and not Hawaii, so ordering a Mai Tai anywhere is probably questionable). After lunch we only had time to walk through a handful of the shops but took some time to chat with one of the local shop owners about local Jeep trails. She carried lots of Jeep-themed merchandise and had some good advice on where we might like to go. 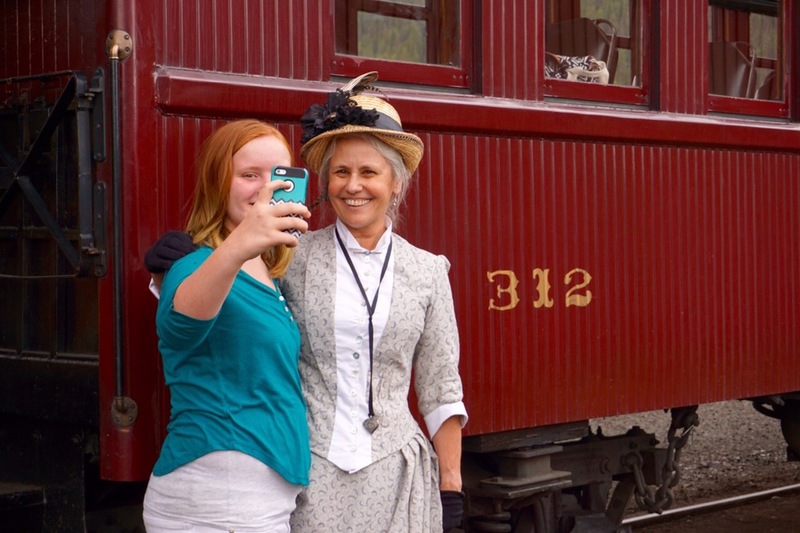 Overall, touring Silverton by train reminded me of the shore excursions on cruise ships. They drop you off for 4 hours in a Mexican tourist town and pretend like that’s enough time to get a feel for the local culture. It’s never enough time and it didn’t feel like enough time in Silverton either. 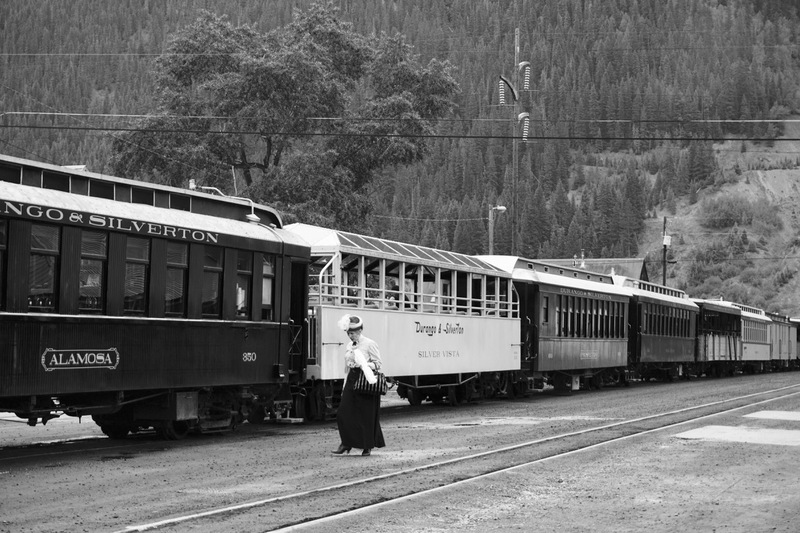 Some people choose to stay overnight in Silverton and ride home on the train the next day so that they can feel less rushed. On the way home, however, we overheard some of these people talking about how the town basically goes dead and closes up after the last train leaves at 3:30 pm. They just sat in their hotel room wondering why they had spent the extra money to stay overnight. But in our case, the main draw was really the train ride, which was exceptional. We both got a little sleepy on the ride back (it was a long day!) but the views didn’t feel like a repeat of the morning because we were seeing everything from the other direction. 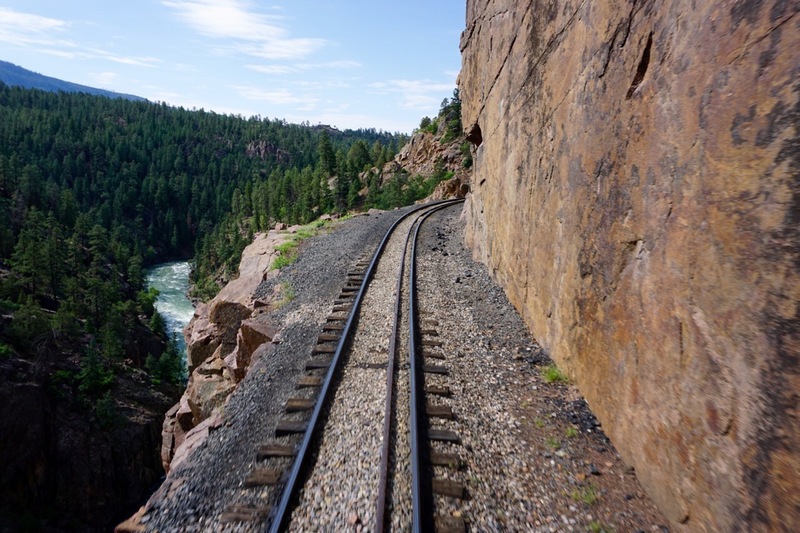 Bottom line, if you are near Durango take a ride on the train. It’s a tourist trap that is totally worth the money. Also, by paying to ride the train you are supporting efforts to retain the area’s history, which is always a good thing. We were completely exhausted when we got home. Riding a train for 7 hours is no joke. We actually woke up sore the next morning, probably from trying to keep our balance on the winding train as it rocked back and forth. I can’t imagine how people must have felt after riding on a train cross-country. We both slept in the next morning, still recovering from the train the day before. 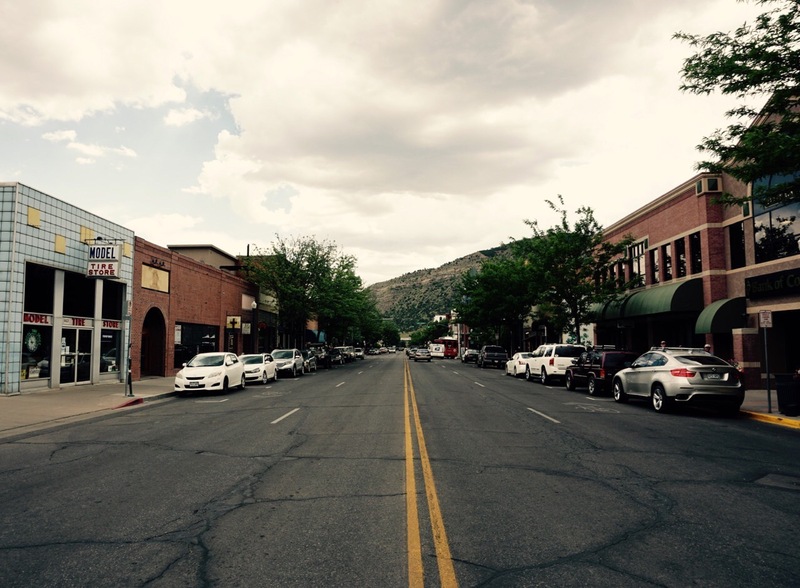 We hadn’t made a plan for the day and decide that we needed to run some errands but would combine them with fun sight-seeing in downtown Durango. We needed to go to the grocery store and we needed to get an OHV permit for Colorado. On the way into town we noticed a gay pride festival going on in the park. Neither of us has ever been to a pride event before so we stopped by after lunch. 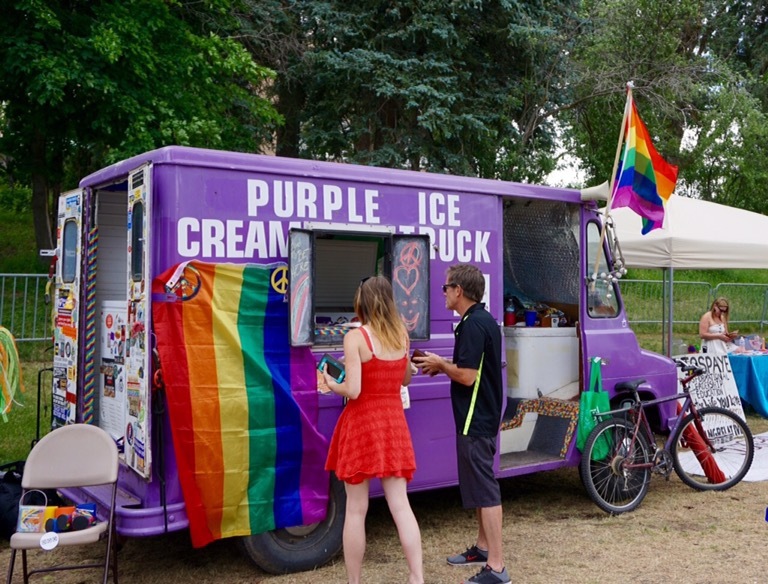 It was a nice event with lots of booths with local resources relevant to the LGBT community. There were also drag queens in full regalia. Apparently, there had been a big drag show fundraiser the night before. We weren’t at the festival long before it started to rain and we retreated to our car. 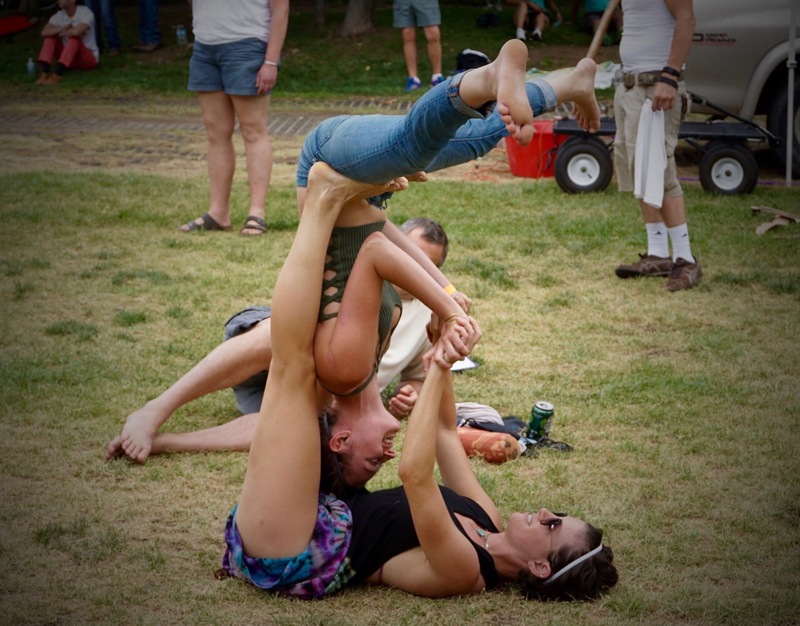 My favorite part was watching these two women doing very impressive acrobatic yoga. 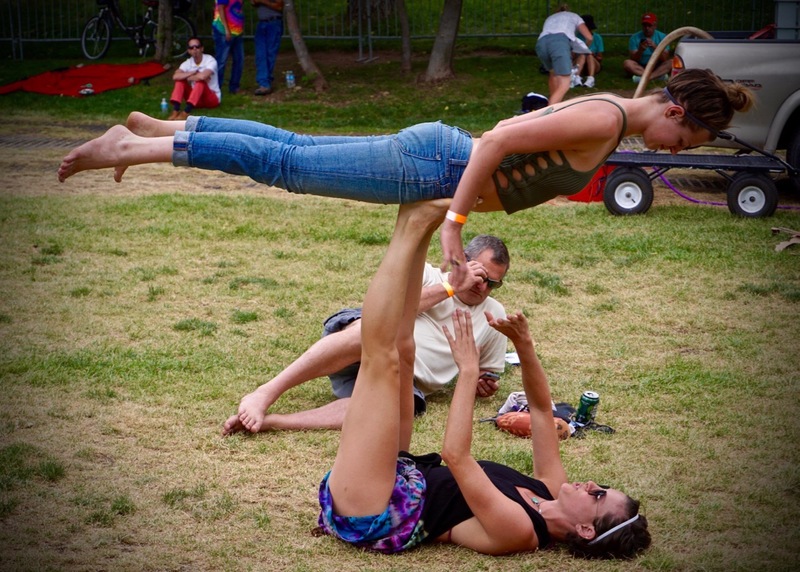 It clearly took a lot of strength but they made it look very graceful. 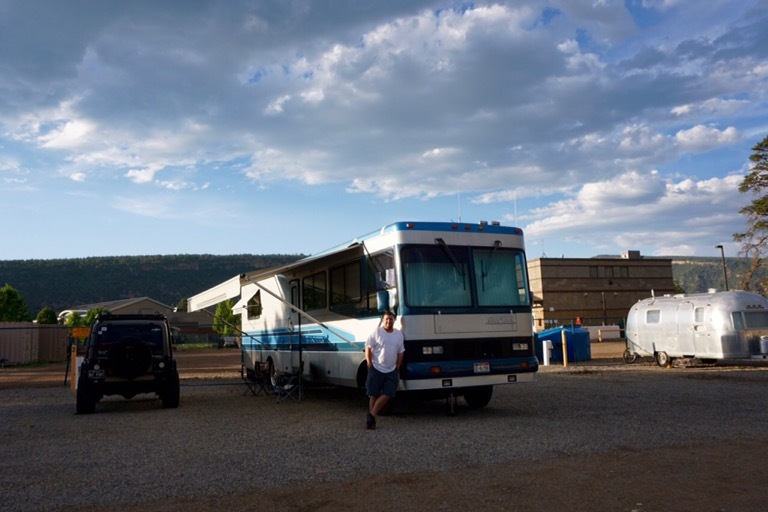 After tracking down an OHV permit at a local dirt bike and four-wheeler dealer and picking up groceries at the City Market, we went back to the RV to clean house. Living in 375 sq. feet means that it doesn’t take long to clean our house but also that it gets dirty really fast. Once frantic morning and it looks like a tornado went through. After coffee and tea the next morning we got out our bikes to go explore Durango via the trail that runs parallel to downtown and follows the Animus River. It was a Sunday morning and the weather was nice so we shared the trail with lots of other cyclists, runners, and walkers. But the trail is wide and mostly paved. So everyone had plenty of room. 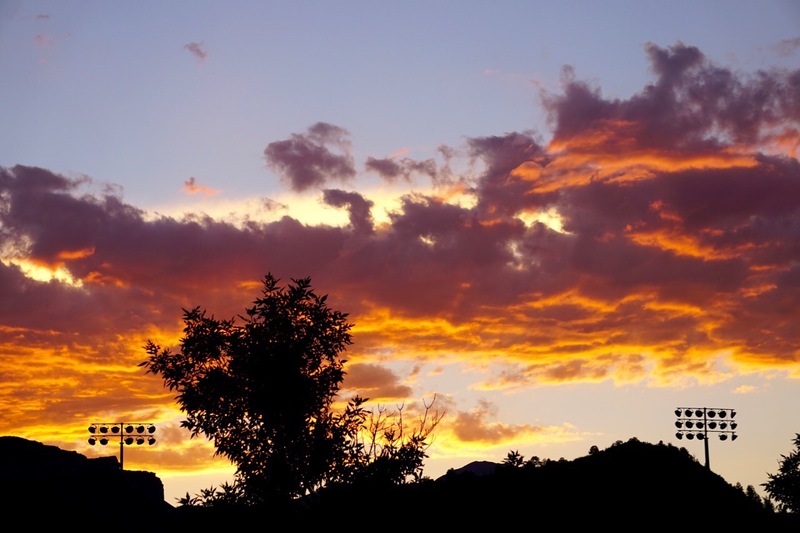 The trail was just lovely and yet another reason we love Durango. It is such a wonderfully put together town. The trail goes all the way across town (possibly farther, I couldn’t see the end on my map). We stopped at the far end of downtown when we found a restaurant with a nice shaded patio overlooking the river. We thoroughly enjoyed our lunch at the Animas River Cafe. We could watch kayakers and rafters go down the river and the resturant served bottomless homemade potato chips! On the way back we stopped at the White Rabbit bookstore, probably the smallest bookstore I’ve ever been in. The books were all used and I enjoyed the owner’s focus on the fantasy genre. She was even playing the Harry Potter soundtrack and had a giant chessboard in her outdoor reading garden. Back at the RV we unhooked utilities to go and find the dump out station, saving ourselves some time when we leave the next morning. The fairground does not have a dump station or sewer hook ups but we had heard that there was a free dump station at the Santa Rita Park two miles away. It is very nice of the city to offer a free dump station for RVers and it was also very well set up. The drive through town was simple and there was plenty of room at to park and turn around. 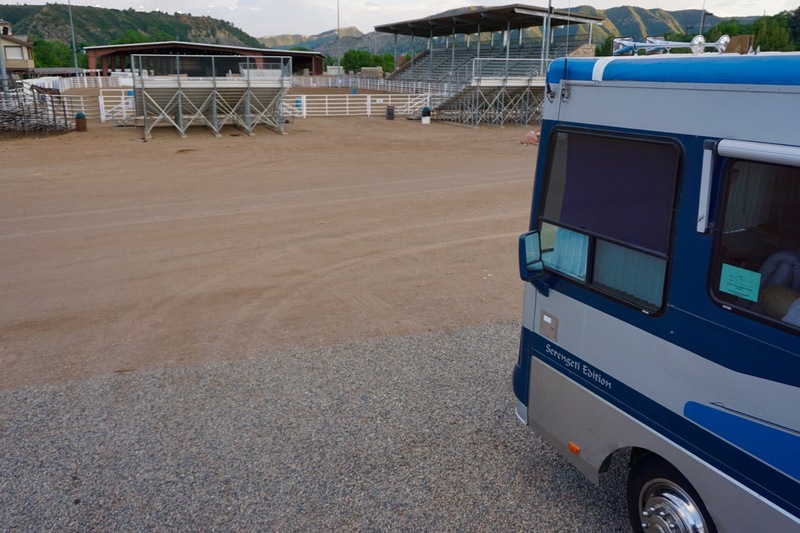 If you ever stay at the Durango Fairgrounds we recommend taking advantage of the free dump out at the Santa Rita park. While at the dump station we noticed that the refrigerator vent cover on our roof was missing. It must have been blown off by the wind on the drive to Durango. 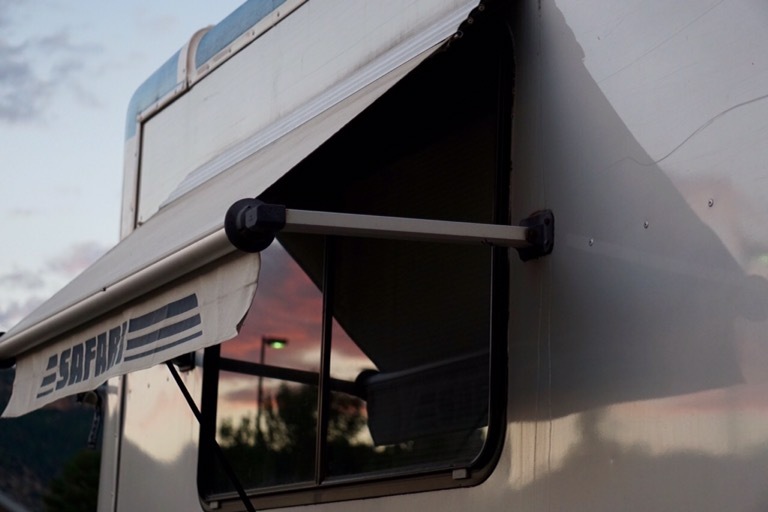 Being a Sunday, all the stores that sell RV parts were closed but Brandon was able to build his own vent cover using a piece of plastic gutter and two end caps. So handy! Overall, we loved our stay in Durango. 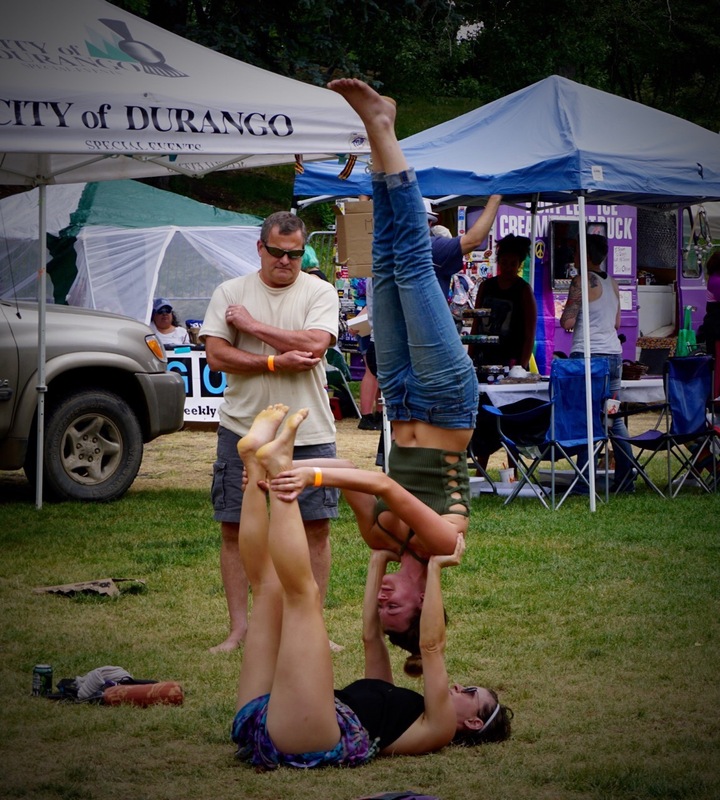 But we’re also excited about our next stop in Ouray, Colorado. In a town known as the Jeeping capital of the world I bet you can guess what our plans include! Very nice. I can see you guys are taking to the camera quickly! The train brings back great memories. 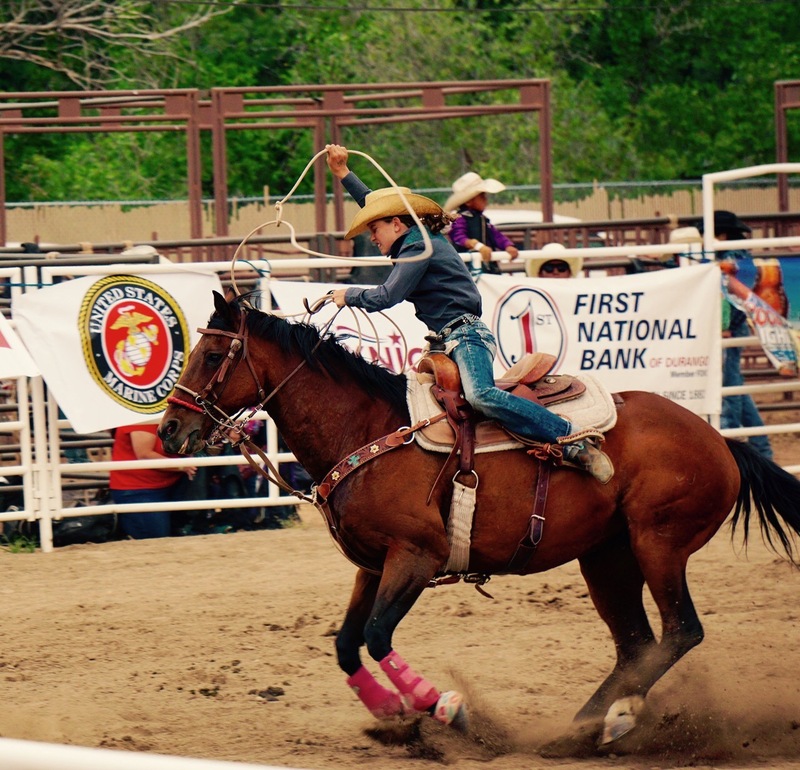 The rodeo really reminds me of my camp days in Buena Vista Colorado as a teenager. Keep on having fun. Thanks for sharing. Love you both.